Breast cancer patients who take multivitamins with minerals are less likely to have disease recurrence than patients who do not take multivitamins with minerals, according to new data. The routine use of multivitamins with minerals also appears to be associated with a decreased risk of breast cancer–specific and overall death. Findings of the prospective Life After Cancer Epidemiology study were reported by Heather Greenlee, ND, PhD, who is a naturopathic physician and assistant professor of epidemiology and medical oncology at Columbia University Mailman School of Public Health in New York City. Her group analyzed questionnaires completed by 2239 women diagnosed with a first primary early-stage breast cancer between 1997 and 2000. “Many women diagnosed with breast cancer have questions about what lifestyle changes they can make to improve their prognosis as a breast cancer survivor, including whether taking vitamin supplements can reduce adverse side effects from treatment, decrease their risk of recurrence, and improve survival,” Greenlee pointed out. Compared with healthy women, breast cancer patients appear to be more frequent users of multivitamins and vitamin/mineral supplements, she added. In fact, data from the 1999-2000 National Health and Nutrition Examination Survey show ed that 57% to 62% of women with breast cancer use multivitamins compared with only 38% of healthy women. “To date, no studies have examined the association between multivitamin use either pre- and/or postdiagnosis and the risk of breast cancer recurrence and death,” she said. Of the study population, there were 363 breast cancer recurrences, 202 deaths from breast cancer, and 372 deaths overall, as of May 7, 2010. Forty-four percent of patients reportedly took multivitamins with minerals at least three times a week for at least 12 months during the 5 years before they had been diagnosed with breast cancer. 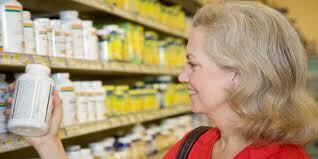 After diagnosis, 60% of women reported using multivitamins with minerals. In the study, women who were categorized as having used multivitamins and minerals after their diagnosis had to have taken them at least three times a week for at least 1 year after their diagnosis. Women who reported that they had continually taken multivitamins with minerals before their diagnosis and continuing afterward were 31% less likely to have a disease recurrence than women who said that they had never taken multivitamins with minerals. 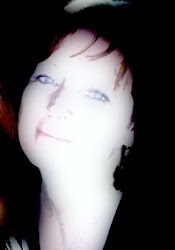 They were also 47% less likely to die of breast cancer and 27% less likely to die of any cause. Further analysis revealed that the protective associations occurred only in women who had undergone radiation and hormone therapy. Despite extensive research and the development of new treatments and drugs, the U.S. mortality rate from cancer has not changed during the past several decades. Yet there are promising nutritional ways of avoiding and even beating cancer. 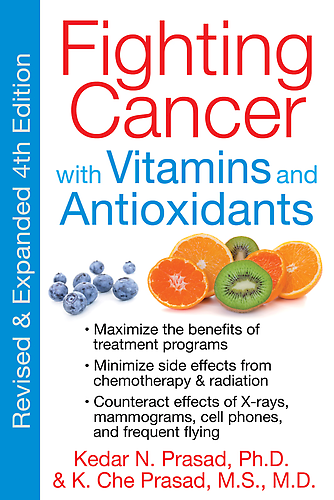 In this completely revised and expanded edition, leading anticancer researcher Kedar N. Prasad and doctor K. Che Prasad reveal the latest revolutionary discoveries in the use of antioxidants and micro-nutrients to prevent and treat cancer--and also help with heart disease, Alzheimer's, and Parkinson's. 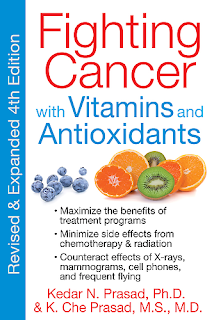 Providing a simple nutritional program to follow, the authors show how micro-nutrients, vitamins, and antioxidants can enhance the beneficial effects of conventional cancer treatments, decrease their toxic side effects, improve long-term prognosis, and reduce the risk of new cancer. Explaining how antioxidants regulate gene expression and cancer heredity, the authors detail how to counteract the risks of dental and medical X-rays, CT scans, mammograms, cell phones, frequent flying, and other unavoidable hazards of modern life; reduce the oxidative stress of free radicals in the blood; and decrease chronic inflammation. Reviewing recent studies, they deflate the controversies surrounding the use of antioxidants in cancer treatment, revealing everything from the reason why many vitamins in foods are destroyed during storage to the surprising role of selenium in cancer prevention. Red Wine protective against breast cancer!